Video ads = sight + sound + motion. What if one of those elements is missing? Can a video ad be effective if it isn't seen and heard? 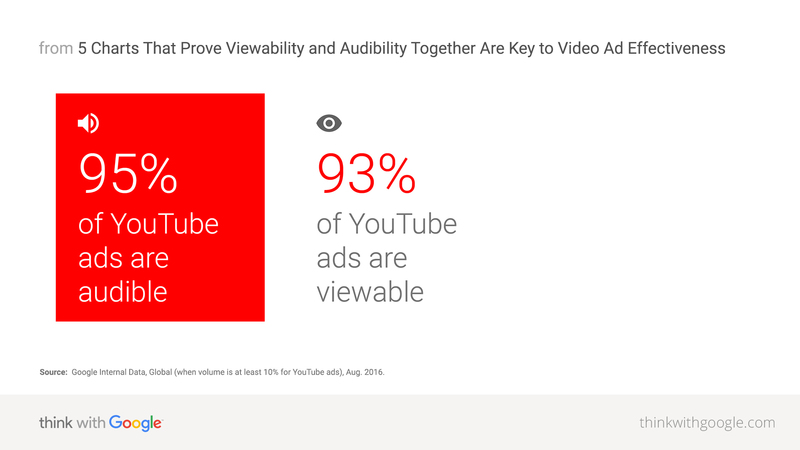 Here we look at aggregated YouTube ad effectiveness data through the lens of viewability and audibility to answer just that. When you think video ads, you think sight, sound, and motion. But what happens if someone only sees your ad without hearing it? Or if someone only hears your ad without seeing it? 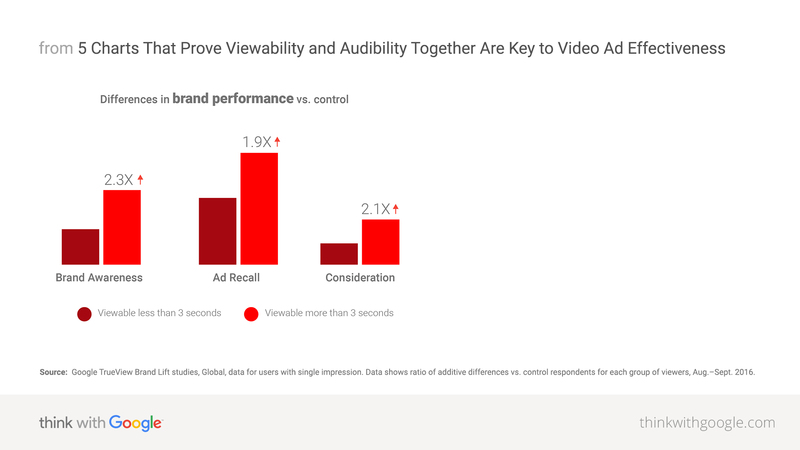 We looked at aggregated YouTube data from over 1,000 ads to see how sight and sound are associated with YouTube ad effectiveness. 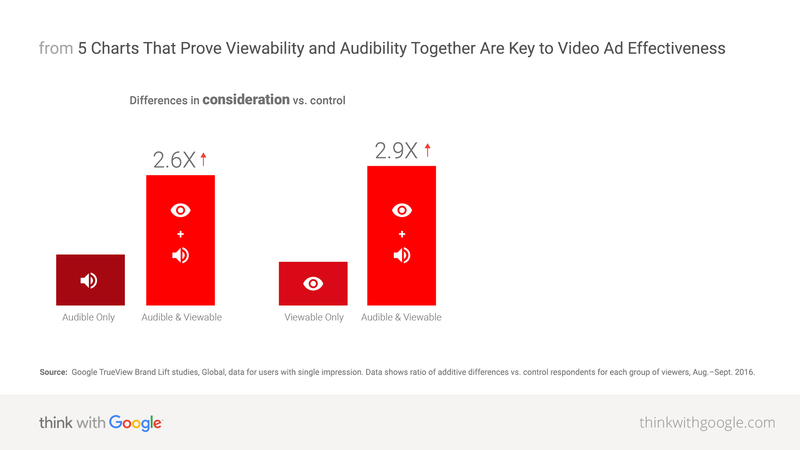 Without sight (viewability*) or sound (audibility**), are video ads still effective? In short, yes. But ads are even more effective when they're seen and heard. Scroll through the five charts below to see how viewability and audibility are associated with ad effectiveness on YouTube. Users who see and hear ads experience higher brand awareness than those who only see or only hear ads. Source: Google TrueView Brand Lift studies, Global, data for users with single impression. Data shows ratio of additive differences vs. control respondents for each group of viewers, Aug.–Sept. 2016. 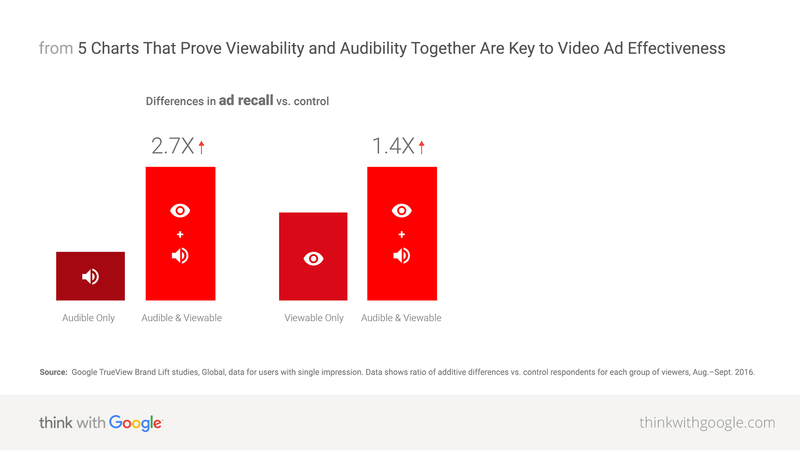 Users who see and hear ads experience higher ad recall than those who only see or only hear ads. Users who see and hear ads experience higher brand consideration than those who only see or only hear ads. Users who watch ads for more than three seconds experience higher brand awareness, ad recall, and consideration. Source: Google Internal Data, Global (when volume is at least 10% for YouTube ads), Aug. 2016. Mere exposure to ads isn't enough. Ads are more effective when they're seen and heard. That means building engaging creative that viewers want to watch and listen to is more important than ever. For more research on the scarcity of attention and what that means for various ad platforms and effectiveness, check out new visual attention research from Ipsos. *Viewable: At least 50% of ad pixels are viewable on screen for at least two seconds (the Media Rating Council definition of viewable). **Audible: Audio level greater than or equal to 10% at some point during the ad playback.